Tony Palmer’s All You Need Is Love series episode 13 is Mighty Good: The Beatles. Don’t ask me what the first 12 or the last 4 episodes in this series are about because I have no idea. I was trying to spend some points I had earned on one of my credit cards and that’s how I got this DVD for free. I’m not really sure where to begin in telling about this video. I don’t know that it’s worth too many words or my time to type them! It’s approximately 1 hour long and spends the first half talking about the Beatles. Actually, it’s mostly a stoned and/or drunk Derek Taylor talking about the Beatles (and if you follow this blog for any length of time, you’ll know how I feel about Derek!). They have bits of film with John, Paul and Ringo talking and a whole lot of Murray the K. But after about a half hour, the video turns into something else with Roger McGuinn talking about The Byrds and video clips of The Animals. Eventually, it does get back to the Fab Four, but then drifts off again. I rate this DVD, 1 out of 4 Beetles! I decided to delve back into my free Amazon Prime movies to see what’s available in the way of Beatles movies/documentaries that I hadn’t seen or heard of yet. It’s been a busy weekend and I didn’t have much time, so I chose the 48 minute documentary I Killed John Lennon . This movie is also available on DVD. This movie revolves mostly around the 200 minutes of taped interviews that reporter Jack Jones did with Mark David Chapman over a period of six years starting in 1986. Mixed in with bits of audio from those tapes are interviews with Jack Jones and several psychologists who have read over the transcripts and present their analysis of Lennon’s murderer. I rate this film, 1 out of 4 Beetles! All Things Must Pass has been on my wishlist to view for a couple years now. It wasn’t until a friend happened to mention it on Facebook that it I finally decided it was time to watch this documentary. The movie is directed by Colin Hanks (son of Tom Hanks) and was officially released on March 19, 2015. A little background info about me to make it understood where I’m coming from when I write this review. In 1986, at the age of 21, I got a job working as the 3rd key manager of the local Sam Goody‘s store in the mall. It was at this time, I also started dating the man that would become my husband (see picture). He worked in the same mall managing a privately owned record store called Grand Records. By the time we married (actually, we found out when we returned from our honeymoon), Grand Records had been bought out by TransWorld Music. My husband worked at the same store but it’s named had been changed to Record Town. Within a year, I was working for the same company at a store called Tape World in another mall. Our dream, like so many others of our generation was to some day own our own record store. Now back to my review of All Things Must Pass and the story of Tower Records. What started as a small record section in the back of Tower Pharmacy in Sacramento, California in the late 195o’s was soon to become an empire when the owner’s son, Russ Solomon, asked his father if he could expand the record department. Instead, his father signed over the record business to Russ and thus, Tower Records was born in 1960. After opening several more stores in California, by 1979 they opened their first international store in Japan to huge crowds standing outside to be the first to explore the extensive racks of American and international music. Eventually, Tower Records would have stores on the east and west coasts of the U.S. along with stores in the United Kingdom, Canada, Hong Kong, Taiwan, Singapore, South Korea, Thailand, Malaysia, the Philippines, Ireland, Israel, United Arab Emirates, Mexico, Colombia, Ecuador, and Argentina.But by 2004, they were filing for bankruptcy. So what went wrong? I rate this documentary, 4 out of 4 Beetles! I delved back into my Amazon Prime account to see if there were any new Beatles flicks I could watch for free. That’s where I discovered the 2004 documentary – Brian Epstein: Inside the Fifth Beatle . If you don’t have Amazon Prime, you can rent it for $1.99 or buy it on DVD for about $5 or less at Amazon . Or you can skip all of the above and just watch the documentary online here for free! Okay, now that you know you can buy it, rent it or watch it for free….maybe you’d like to know if it’s at all worth it? This hour long film actually isn’t bad at all! There are many familiar names and faces of people that provide personal stories and commentary on working with the fifth Beatle – Brian Epstein. Included among theses are promoter – Sid Bernstein; Brian’s personal assistant Alistair Taylor; Brian’s secretary Beryl Adams; Mersey Beat owner Bill Harry; Beatles first manager Allan Williams; historian Richard Porter; and Beatles chauffeur Alf Bicknell. (Interesting note that Alistair, Beryl and Alf all passed away within months of this documentary being released.) There are snippets of conversation with Cilla Black, John Lennon, Paul McCartney and Derek Taylor mixed in with the often repeated, but tolerable newsreel and film clips. One point I couldn’t help but notice is that Alistair Taylor is very prominent in this film and provides most of the narration and maybe that was because he was the closest to Brian before and throughout the Beatles years. And interestingly, Alistair also wrote several books on the topic of the Beatles himself, but I’ll save the topic of Alistair’s books for next week’s review! I rate this documentary, 3 out of 4 Beetles! I should charge every one of my readers $1 to read this blog, but even that won’t compensate me enough for the hell I had to endure watching this film. As if having to go to the gym and having to walk on a treadmill for an hour everyday isn’t bad enough, I decided to raise my anxiety level by adding this piece of crap to the mix two days in a row! I hope you all are happy…because I surely took one for the team to put out this public safety announcement. Scream And Shout is an 1.5 hour film about nothing! Yes…this my friends, could be a Seinfeld episode but the joke is on the viewer. What in the world were these people thinking when they made this? And to think that it currently is reviewed at 4 out of 5 stars on Amazon! Just click here to watch the trailer. Not only is this a mess of bad newsreel footage, clips of interviews that are almost inaudible, they actually have typos in their sub-titles! At one point, while two current day musicians are being interviewed, the date “September 7, 1964” is at the top of the screen. And don’t even get me started on the product placement. I think they put an ad out for any bands with a Beatles sound, to “please donate your songs to this project in exchange for on screen credit.” And I believe their experts/historians were all told they would be given the opportunity to audition for their next big gig in this movie. I rate the documentary, a very generous 1 out of 4 Beetles! I thought I would take my time writing my review about Eight Days A Week since I know all the Beatles fans will be scurrying out to see the film themselves and every Beatles media person will be in a hurry to post their own review about it. But just when I thought I could take my time, everyone else’s reviews started popping up on my social media timelines. I won’t read other’s reviews before writing my own. I want mine to be fresh. Even in this case, I’ve asked guest review and friend David Thomas to also write a review for the film (it’ll appear after mine on this same post), and I’m not reading his until after I’m done. Was it a great movies? Yes, it was awesome! I know people who are already planning to see it multiple times. My thought was that I can’t wait for it to come out on DVD/Blue Ray. It’s absolutely a film you’re going to want to see again and again. Ron Howard did an excellent job of choosing the right footage and cast of characters. He interviewed both Sigourney Weaver and Whoopi Goldberg to talk about what it was like to be a fan in the early years and about their own experiences of seeing the Beatles live in concert as teenagers, two ladies I would never have guessed would have attended. I think my only complaint might be that we never hear Whoopi’s reaction to the actual concert at Shea Stadium. Beatles fans need to give Ron Howard a lot of credit for not beating the obvious points and trivia into our heads…like the Jesus vs. The Beatles comment from John Lennon. It’s in there, but he keeps it in the flow of the documentary…same as the riot in the Philippines. Mr. Howard brings up early footage of the wives and families with quick glimpses of Ringo, Maureen and Zack, and John, Cynthia and Julian, (where were George and Patty Boyd though?) and then moves on. No Beatles family members were interviewed on camera for this…and that ain’t so bad! It’s keep as documentary about the Fab Four and not the opinions of their feuding family members. I think my readers get the point without me continuing to ramble on. It’s a great film, wonderful footage and of course, Ron Howard is already talking about doing a second Beatles documentary! Go see the movie or pre-order the DVD. I rate this movie, 4 out of 4 Beetles! I titled this review “a fan’s perspective” as somewhat of a disclaimer. It is often difficult to know what would be of interest to anyone who has not been as steeped in the history of The Beatles as I have been over the last 50 years. Not that I claim to have seen it all, or that I know it all (far from it); but I also cannot assume that everyone has read all the books and heard all the music that I have over that period of time. What the film does best, is give the viewer a clear picture of the mania that surrounded The Beatles during their career. This movie brings it home in a way that no fan has experienced before. 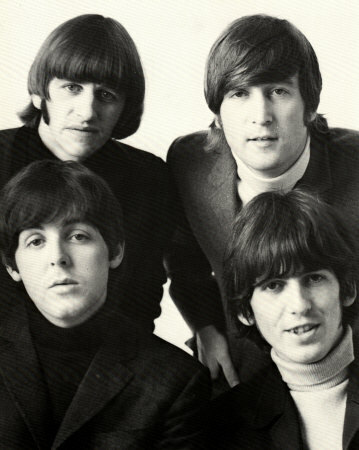 Although I have been a Beatle fan since their first performance on Ed Sullivan’s show in 1964 (the quality of which was strangely poor on the big screen – I thought that would have been one of the better examples), I was too young to have actually attended one of their live concerts in person: I was only 7 when they played their final show in Candlestick Park in 1966. Even if you had the rare privilege of actually attending a Beatles concert in person, that was just one mad night that you will likely remember forever. The Beatles experienced that madness every day of their career, and most intensely during their touring years. I left the theatre wondering how it is that they were not all afflicted with some sort of Post Traumatic Stress Disorder. A few pieces of footage have been colorized. Some of the concert colorization is nicely done, but the famous NY Pan Am press conference has a rather unnatural look to it. None of this lasts long enough to be a major distraction, however. In some cases audio had to be “synced” to the film from a separate source; i.e., the film may have been a silent film, but the audio was recorded separately, and then combined, or simply brought in from a better source than the one accompanying the actual film. This can get dicey, especially if done poorly. Music producer for the film was Giles Martin, son of The Beatles original producer, George Martin. Giles has worked magic with many previous Beatles projects, including the re-mixing and re-mastering of 1977’s “The Beatles at The Hollywood Bowl”, which was released in conjunction with the film. Giles was quoted in a recent interview as saying “Imagine going to a concert today, recording something on your phone, and then intending to play it in a movie theater,” Martin says. “That would be better than what I was given.” The talented Mr. Martin did a tremendous job of making the music performances not only watchable and listenable, but for the most part, truly enjoyable as well. The theatre where I saw the film had people queuing up more than an hour before show time in order to get a good seat, and there were 3 showings scheduled that night, 2 of them sold out. I got there an hour before show time, and there were 20 people ahead of me. 20 minutes later, there was a line behind me that went on for as long as I could see. The anticipation in the theatre was visible, although one person I talked to in line had not read or seen anything about the movie prior. He said he “just saw it was The Beatles, and bought a ticket.” The power of the name “Beatles” more than 45 years after they broke up is still truly remarkable. Fans all have their own Beatle experiences, memories, and reasons for seeing a film such as this. And fans will find something to criticize, be it the fact that they have seen some of the footage before, the colorization was not to their liking, the audio was not perfect. In this digital age we take for granted near perfect sound reproduction and 4K resolution. But considering what they had to start with, none of the obvious shortcomings should be enough to keep you from enjoying this movie. To paraphrase Paul McCartney, “it’s the bloody Beatles…shut-up”. For the non-fan (is there such a thing as a non-Beatles fan?) or even the casual fan, it should serve as a concise historical document, which informs as well as entertains; what more can one ask from a documentary? If you are fortunate enough to see this in a theatre, it IS being followed with a full 30 minutes of footage from the famous Shea Stadium concert. We have been told that that footage will NOT be on the DVD or blu-ray release. It looks great, is a lot of fun, and even though Giles Martin toned down the screaming considerably in the mix (no small feat), I could see why they said “enough” in August of 1966.